Outdoor brand Merrell has launched the One Trail project, a campaign celebrating diversity on the trail and seeking to contemporize attitudes about outdoor participation. 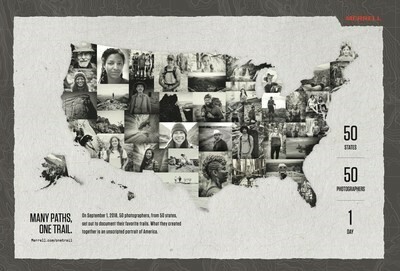 The first element of the campaign is a mural of portraits taken on trails across the country on Sept. 1, 2018, commemorated in an online gallery at Merrell.com/OneTrail. On　Sept. 1, 2018, Merrell dispatched 50 photographers (one in each of the 50 states) to their favorite local trails, and together, they created an unscripted portrait of America – on a single day. The individuals included in the campaign are not paid models, athletes, or social media influencers. The group of participating photographers are as diverse as the real subjects they encountered. They include well-known outdoor photographers like Jeff Johnson (who photographed California’s Half Dome),　Ryan Redcorn　(a citizen of the Osage Nation who lives on the Osage Reservation in Pawhuska, Oklahoma) and a variety of other talented photographers with different backgrounds and passions. The gallery will live on Merrell.com/OneTrail and will be featured as a two-page spread in select national magazines. Merrell will also bring the images to life in gallery-format on Nov. 8 at the Outdoor Retailer show in Denver, Colo.